This was a ramble we had wanted to do for a long time, so we took the plunge and put it on as a winter regional ramble - even though it was the last auction of the season. Weather is the crucial thing, as we all know, and luckily for us we had a grey, but dry, day sandwiched in between two wet days so we were very pleased. We had an intake of 14 for this ramble, which was really great, but ended up with 10 due to illness getting in the way. 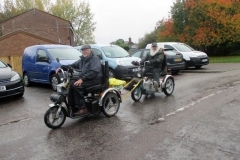 We were very pleased to welcome Bernard, who can’t get out very often as he is a full time carer for his wife, and Paul & Sheila who are very enthusiastic new members and Paul arrived with his Mayan scooter lit up with loads of Christmas lights which lent a festive element to the day! We had a good mix of personalities both longstanding and fairly new and many thanks to them because out of all the 10 scooterists there Bob and I were actually the only “locals” to the area and everyone else had travelled an average of 40 to 50 miles to come and two present stayed in hotels for the night, plus Paul has to hire a van to transport his Mayan, that’s dedication for you! Shows how important regional rambles are to people. We had to change the route from a super circular one to a equally super linear, although we did a loop at the beginning which was a slight detour to make the homeward trip a bit less “there and back”. This was because there is a serious bog on the way and although Bob and I got through it a week or so ago, when we reccied it a couple of days before it was a virtual sea of water and mud because of the heavy rainfall recently, so we deemed it sensible to avoid it, be OK in the summer though. There was still plenty of mud and gore so that pleased everyone, and some of the group had some fun on some hilly banks on the way and did some exploring as well. We arrived at the Pony Sales by about 12.15 where it was all well underway, these auctions have been on this site for the last 60 years and are run by the New Forest Livestock Society who provide the stewards to handle the ponies and keep a maintenance schedule in place with the sales run in association with the Auctioneers. It is a very iconic wooden structure which is roofed so that people attending can at least stay dry. The ponies are treated very well and all have access to hay and water, we saw no mishandling whatsoever and found it very interesting and picturesque. This area is usually very quiet and serene but today it was absolutely chock full with horse boxes, landrovers, trucks etc. plus, hooray!, some refreshment vans - Paula, Pete and Roy devoured an egg and bacon bap each - looked delicious too. We left the auction at about 2.00 to get back before it got too dark and we had a good trip back, there were plenty of mud and puddles also a shallow pond that was used to good advantage by some of us. Linda did some exploring of the heathland on the way back, good to see her belting around in the distance having a good time. A lovely trip and lots of laughs and chat on the way, thanks to all for coming and making it such fun. Please remember - if you have a favourite route you can share, please do - just email our chairman on the DR website to get some help and advice. Very important to have input from our members so we can keep plenty of rambles available to all DRers all over the country. People will travel a considerable distance to a regional ramble so don’t think you won’t get any takers - you will. Best wishes, Val and Bob. Ditchling Beacon new gate & path opening on the South Downs, Sussex. On the 26th of October 2018, Bob and I attended the opening of a new gate, signage and path at Ditchling Beacon, East Sussex to enable us to access this new route of approximately 5.5 miles. This was sponsored by Gatwick Airport as part of their community engagement programme and in attendance were Andy Gattiker, National Trails & RoW Lead from the South Downs NPA, James Winkworth who organised the day also from SDNPA, Melanie Wrightson, Gatwick Airport Community Engagement Manager and Andy Pule, Head of Terminal Operations at Gatwick. A 2 minute interview on Radio Sussex can be listened to on this link: https://www.bbc.co.uk/sounds/play/p06m86hx. It is 1.56 hours into the recording. We raised the problem of this path last year with Andy G and because of the funding from Gatwick they were able to do the improvements - prior to this we couldn’t get through the gate as there was a sleeper across the entrance and apart from this the uphill climb to access the route was too furrowed and steep to safely negotiate. The new gate was relatively easy to do Andy told us, but the actual path formed part of what is classed as an ancient monument and they had to apply to all the right Authorities to get permission to undertake the work and they weren’t allowed to fill in the furrows, they had to lay a membrane on top and overfill the membrane itself so that the contents of the furrows remained as they were for future generations to explore. Over the membrane went various other layers of filling, such as sand and other substances, to fill up the dips and hollows without actually disturbing them, then a substantial top layer of firm surfacing resulting in a lovely smooth path that we can easily get up. The route that follows is really breathtaking and you get a feeling of total tranquillity as you go along the tracks, it is quite a challenging ramble but great fun and goes through a wonderful green, lush valley. We start from Ditchling Beacon, going through the new entrance and path and then steeply downhill into a lovely green valley and onward through this wonderful area through a farmyard, a field of crops, some very “lumpy” and quite challenging tracks, until we emerge onto the South Downs Way near to Jack and Jill windmills from where we return to Ditchling Beacon. In this area alone we now have 4 or perhaps 5 rambles of varying lengths. I say “perhaps 5” because the routes are quite hilly and demanding on the batteries, OK for lithium of course, but one of the routes means going up a very steep and long ascent and it is a little worrying in case the poor old batteries decide they’ve had enough. However, there is a shortcut on this particular ramble so - if the batteries hold out there is 5 rambles! 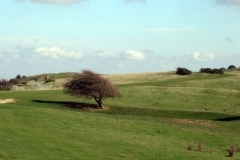 Our thanks must go to the SDNPA in particular for all their help and understanding, and whenever we come across a problem they will always try to help if they can. In this case, the sponsorship by Gatwick Airport has made this new route possible, very gratifying that they are so generous and public spirited, so many thanks to them. This isn’t the only improvement that is being done either, at present there is work going on at 4 or 5 different places on the South Downs as a result of this funding. 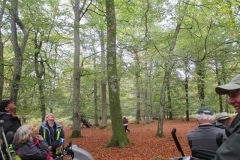 New Forest Walking Festival - Churchplace Inclosure and Ashurst Woods. 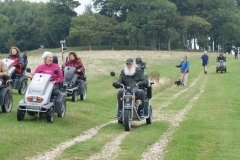 17th October 2018 We ran this ramble on behalf of Disabled Ramblers for the New Forest Walking Festival and we had 9 proposed attendees, however - it rained! Even so, we still had 7 scooterists turn up which was really rewarding and the rain was intermittent and not very heavy, and with proper togs on it isn’t really too bad. Through our FB we now have 2 more potential new members so it is working for us. 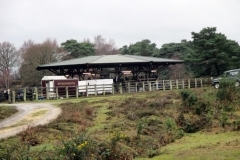 We left the Happy Cheese car park and headed into Churchplace Inclosure through the ever more colourful tracks and up onto the open forest so that we could show our new people the lovely view and the magical feel of the New Forest that we all enjoy so much. We did a little detour over the railway bridge and down to the river so that the dogs could have a swim, which they did and with great enjoyment! However, just as we were going down to the river Paul, one of our new guests, had a puncture on his back wheel - Bob tried injecting foam sealant and pumping it up, which did work for a while but it did go down again, so on our return to the track to take us onward for the rest of the ramble, the tyre was pumped as hard as it would safely go and Paul took the track to lead him back to the car park as fast as possible before the tyre went down again. He made it too, and in spite of this setback he said he had a fantastic time and hopes to get a more suitable scooter so he can come out with us more often without worry. We were pleased that we had the equipment - the foam sealant and an electric pump that plugs into my Tramper, gives us a little more confidence when out in the wilds. We then progressed through Ashurst woods and the empty campsite which I had hoped to explore a little more, but due to the rain we just did a quick route through and back up to the Happy Cheese pub to warm up and have a meal. 6 of us went in and it was lovely to get warm and have a chat. As ever, there were more problems! Brian had been on the famous Dora as his TWS is having battery trouble, and sadly Dora wouldn’t budge - the rain had crept into the electrics and as I write Bob has the hair dryer on it hoping it’ll dry it out. Poor old Dora, she does go through the wars lately! Bob towed Brian & Dora nearly 2 miles back to my house with me behind with hazards on, a sad little convoy, but we made it safely. The ramble was very successful and we all enjoyed it in spite of the damp conditions. Of course, today is beautiful with blue skies and quite warm. Oh well, the joys of rambling! Onwards to the next one and fingers crossed for good weather this time of year. Never daunted. PS!!!!! Dora is OK, Bob’s physio and hydrotherapy treatment with the hair dryer has been successful!! Thank goodness for that. Bolderwood to Cadmans Pool Great trepidation today - very wet according to the forecast - and sure enough it started off really bad, but by the time people started arriving to sign on it had stopped and it held off all day, much to our astonishment. Bolderwood is a lovely area planted very carefully with many varieties of trees and is close to the Rhinefield Arboretum so is quite a large area which is very popular for its scenic beauty. This was a much more open ramble and it was with great relief that we realised it may, after all, be quite a decent, if grey, day. It was nice to have the company of Adam Vasey who is a National Park Access Ranger, he is new to the area having come from Exmoor and wants to get to know the NF and all its secrets. 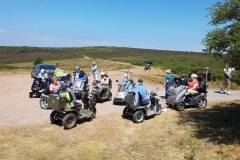 We had been able to reccy a new route which meant that we didn’t have to go on the road at all, only for crossing, and is across quite remote parts of the forest so we got to see the New Forest heathland which would have been missed going on the road, as we have done in the past. Our route takes us through an underpass and to our shock one end was gated off and padlocked, but luckily we come armed with a key to the New Forest gates, so we were OK and got through. It was locked because there was a pony Drift on today and they didn’t want the ponies escaping through the underpass. On to our coffee break, where unfortunately, Paula was feeling unwell and had to return to base escorted by Bob who had to unlock the gated underpass! He soon caught us up before we reached the end of the long path through Slufters Inclosure. We saw cows, ponies and donkeys in the Inclosure today which is quite unusual but very nice to see. By now it was very windy and we reached Cadmans Pool and took shelter under some lovely beech and oak trees to have our lunch. Cadmans Pool was dug in 1960 by Arthur Cadman deputy surveyor of the NF at that time, to perfect the ambience of the area and is home to many waterfowl. Carp fishing is allowed on a day permit too and there is a large variety of woodland birds, finches, firecrests, woodlarks and the lesser spotted woodpecker. We then returned via the Bolderwood Deer Sanctuary and did see some deer, both stags and hinds, and going through Bolderwood is a treat, and like Wilverley the day before, it is planted with many species of trees and is very lovely. This was the end of the week’s four rambles, now we have to start planning for 2019! 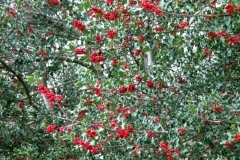 Lots of red holly berries along the way and the huge tree trunk and root in the photos is quite a landmark now. 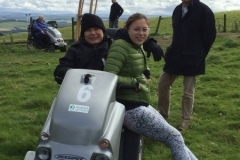 Lastly, we would like to thank Bernard & Judy for their dedication in towing the MSU and unloading and getting the trampers organised, putting up the loo tent and all the other things they do - would be difficult without them. Also, the walkers and volunteers who help out with road crossings (although we didn’t have many on these rambles) and gate opening etc, and pushing us out of mud, John BMX who always comes on the rambles and helps out whenever possible, he is a stalwart member of DR and one of the founder members. A lovely year of rambles, I think you will agree, so if you have any you can put forward - please do, either for regional ones or for the national programme - without rambles the group can’t work! Wilverley Figure of Eight Another lovely day for this really super ramble. 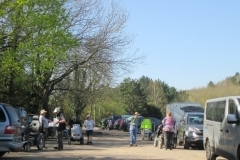 It’s a huge car park and there should be ample room, unfortunately, almost all the space got quickly filled up with another group, this time the New Forest Runners, so it was, in the end, a bit of a squeeze but we managed. We were also entertained by a group of keep fit enthusiasts doing their exercises all around us, their equipment arrived in a horse box before they very energetically began to do their work-outs under the trees. Wilverley has to be one of the most beautiful of all the inclosures in the New Forest, it was intended to do the leafy inclosure in the morning and the more open Hinchelsea Moor in the afternoon, but due to prophesied weather conditions we reversed the route so that if it rained we would have the shelter of the trees after lunch instead of being in the open. So off we went across the Moor - it is a fairly new route for us and one we really like very much, it has lovely views all round of the surrounding forest and is one we want to do during the heather season next year as a regional ramble as it would be a sea of pink with that lovely “heathery” perfume. One spot of bother was a very narrow path that crosses the bog, on one side is a little bank complete with gorse bush and on the other side is the bog - not drownable in but very muddy - I told everyone to be very careful and keep to the left but then I kept too far to the left and almost tipped! It’s only just wide enough to get through and one to bring up with the NF National Park for improvement, (it will be done), everyone managed very well with no mishaps. We got back to Wilverley for lunch and then set off through the inclosure, which is actually more like an Arboretum planted with many different varieties of trees and also has some fairly steep hills which all add to the scenic quality as you go along. The Autumn colours are just starting to show with little showers of leaves falling around us, in a week or two it will be in full oranges, yellows and reds and will be staggering. One of the trees on our tea break stop was covered in soft green moss and lichens, and some tree hugging was enjoyed by lots of us. This was a very enjoyable day and we are looking forward to tomorrow - the last ramble of 2018! Happy Cheese to Beaulieu Road Station A lovely day today for this varied ramble through Churchplace Inclosure at Ashurst and then across open green plains to Beaulieu Road Station. 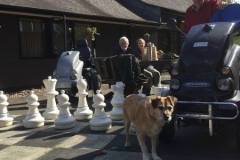 As ever, parking is a problem and we had permission from the Happy Cheese pub at Ashurst to use their car park, but due to the high number of those attending and the large vehicles we have to use, we completely filled the car park. The landlady came over and was absolutely lovely about it but asked if we could "shuffle" up a bit so her lunch time clients would have some space. In the circumstances, we thought she was so completely nice and understanding and we were very grateful to her and did our best to do as requested, making much more space available. I think I may have an alternative place to park another time, but that means another reccy! We went through Churchplace Inclosure which, like most in the NF, is planted with a huge variety of trees - oaks, beech, sweet chestnut, various varieties of pine, making very lovely and varied woodland along the way. We were accompanied by the blaring of the train occasionally, which gave everyone a fright - the main line skirts the inclosure but once you get used to the sound of the trains' horn it is quite atmospheric, like a monster trying to get in! Up onto the open forest to a lovely spot for coffee and then onwards to Beaulieu Rd Station and lunch, under a stand of huge pines. At this point are the NF pony sales auction site and pens which is interesting to see and even more interesting to attend with great atmosphere and stalls and a great variety of people attending, well worth a visit. Some went to the Drift Inn for nourishment until the allotted time of departure, then we made our return back to the Happy Cheese pub, again through Churchplace Inclosure but on a different path. Some 12 of us went into the Happy Cheese for a meal, and they were very helpful and understanding. A good day and lovely weather. Boltons Bench - Pondhead - The Ridge. 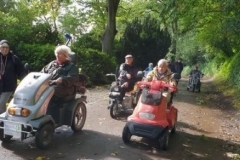 We had an exceptional turnout today with 23 scooters and a very large number of walkers. Bit of a grey day but dry so can't moan at that! Our first stop was at Pondhead Inclosure which is run by the Pondhead Conservation Trust and Dave Dibden met us at the gate to the inclosure. Dave is a woodland forester and has worked there for many years using traditional methods to manage the woodland, such as coppicing, layering the hedges, making charcoal and ensuring the habitat is attractive to butterflies and birds. It is now a Trust and is run by Dave and his team of Volunteers. It is a magical inclosure and we had an interesting talk from him regarding the work they do and the history of the woodland, he then accompanied us on some of the paths around the inclosure explaining things en route. If any of you saw "A Year in the New Forest" a month or two ago, Dave was on that talking about life in the NF, so he has a claim to fame! We had a collection later on, organised by Sue G (thanks Sue! ), and I was able to send a donation of £70 into the Trust to help towards their very valuable work. From there we went onto a track called Beechen Lane which leads through lovely woods to our lunch stop, where the sun actually came out which made the woodland around us look quite different. After lunch we progressed up to Lyndhurst Ridge which is completely open with lovely views across the New Forest to Lyndhurst and across to Fawley in the distance. This is a sandy ridge leading to the lovely little New Forest village of Lyndhurst, however, we had made such good time we decided to divert down a path that Bob and I call "The New Forest challenge". It wasn't too much of a challenge today as it's so dry, but if the weather is wet it's a different matter! It is through open heathland and is right off the beaten track and leads to an area called Longwater Lawn which is very boggy normally, today, for the first time in my memory, we were able to cross the bog to a bridge which had been inaccessible in the past. Lots of forest ponies here. We then returned to Boltons Bench and were homeward bound until the ramble tomorrow. Henley on Thames ramble with The Ramblers - 30th September 2018 Lucy has been working with Henley & Goring Ramblers group over this last year to try to get the message out that there are plenty of rambling opportunities for the disabled of Henley and area to access the countryside and have a lovely time in the beautiful area surrounding the town. Today was the official launch of Henley as a “Walkers are Welcome” town and along with Alie H of Henley & Goring Ramblers, Lucy was assisting in the town centre with the publicity stall so to help Lucy, (can’t be in two places at once! 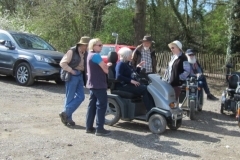 ), 6 Disabled Ramblers, led by Wim H (Alie’s husband), did the ramble alongside the Thames from Henley to Hambleden Lock and on to the Flowerpot Hotel at Aston for lunch. This is a typical example of why linear walks are very rewarding because there was something going on around us all the time. Often linear walks don’t seem to be too popular but we always find that going back “the other way” brings things to our attention that pass us by on our way there. Along this stretch of the Thames, as you will see from the photos, there were young people practising their skill with sculling - and with the coaches on their bikes dashing alongside the river path complete with megaphone yelling instructions (and very good humoured towards us too) - various interesting boats, people running for charity, dog walkers, fields around us with huge flocks of Canada Geese - which obliged by taking off in a huge mass and landing on the river, as they passed you could hear the whistling of their wing feathers - overhead were quite a few Kites circling and waiting for something they could swoop down to eat, several little pleasure boats with flags flying were going up and down, and as well as all this activity there were lovely buildings to see en route. As we approached the Flowerpot Hotel we saw a couple approaching, the lady on a boot scooter, we were just going to hand over a DR leaflet when to our great delight we saw that it was Keith and Brenda Harris, who many of the older, 00ps! I mean longer, serving DRers will remember well. They had taken the trouble of coming to meet us at the Flowerpots and to catch up with news, it was a lovely surprise and there was yet another to come as Keith told us that Jim and Dorothy Mills were waiting at the pub to see us too. It was a real treat to see them - their presence is sadly missed on our rambles, however, they are all doing well but are not able to take part in rambling nowadays. What a really super surprise to see them all. After lunch, we managed to get back to Henley just in time to go and see Lucy and Alie in the town at the stall and have a quick natter. I think the day went very well for us all and many thanks to Alie & Wim for all their help in assisting Lucy to put on some super rambles in the area and also it’s great to see Lucy becoming a really efficient and enthusiastic ramble leader. Thanks very much to everyone who came, the support of members of our group helps to get the word out, as well as people you meet who are always interested in what we are doing on our scooters. Val & Bob. Ramble Four - Harestanes and Peniel Heugh took us to Waterloo Monument which can be seen in the distance for quite some miles along St Cuthbert's Way. It is very impressive at the top of Peniel Heugh standing and looking upwards at this great column. Once again it was bright and breezy with views of the Cheviots and Borders. Another great day and back for tea at Harestanes Visitor Centre. A vote of thanks to James Babington Smith for a lovely day out. Ramble One on Blanchland Moor, on Monday, free of grouse shooting, was breezy and sunny with great views across the moors. At the top we lunched in style out of the wind inside the shooting lodge but had to abandon erecting the toilet tent before it took off. Coming back down was a bit of an adventure avoiding deep ruts and then getting out of the way of huge forestry wagons but back in time for tea in Blanchland. Many thanks to Hugh and Jill Williamson for organising this lovely ramble. 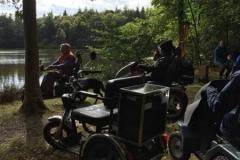 Brownsea Island - DR working with the National Trust & Dorset Wildlife Trust during 2018 to make the Island more accessible for scooters, wheelchairs, powerchairs, etc. Early in 2018 DR was asked to assist in a photo shoot organised by the National Trust in an effort to publicise the existence of a new disabled friendly ferry called the Sea Horse specially provided by the NT to enable people on scooters, power chairs, wheel chairs etc to be able to go to Brownsea Island in Poole Harbour - a trip which until now, had been impossible for us to achieve. Bob and I went over in June and spent an enjoyable day being photographed and taken around the Island, the ferry is totally dependent on tides and you can’t afford to be late or you may end up having to stay on the Island for the night! This is the link that tells you all about the ferry and what you have to do to book it etc. During the Winter the opening times of both the ferry and the Island are changed, and both actually close down for part of the winter to allow for repairs and upkeep, so please check that they are actually open before travelling: www.nationaltrust.org.uk/brownsea-island/features/accessible-brownsea We went over again on August 1st with Linda & Peter, who most members of DR will know, to celebrate their wedding anniversary and had a really super time, and explored many secret paths with them and had great fun. It is a lovely Island and the NT does a lot with scouts and girl guides and so on, so there is plenty of activity there. An idyllic place for a young person to gain a real love of the countryside and associated wildlife. This month, September, four of us went over at the invitation of the Dorset Wildlife Trust who lease almost half of the island from the NT as a nature reserve. It was mainly to help them to improve the disabled access with such things as wooden ramps to the hides, the boardwalk etc. At present, it is not possible to use their ramps to gain access to the hides without a lot of difficulty and extreme maneuvering. 10 point turns for example! There is a big improvement plan in the pipeline to provide a new Visitor Centre in keeping with the tranquillity of the reserve, nothing garish or blatant but something that will blend in with the surrounding area and be accessible for all. We were able to point out that anything as big as a Tramper would need more space to negotiate the twists and turns on some of the ramps and hopefully this information will be put to good use when the plans come to fruition. This part of the island is much quieter and is primarily a wetland nature reserve with a large lagoon with many sea birds on it, such as: Little Egrets, Herons, Avocets, Terns, Curlew Sandpipers (fairly unusual), Curlews, Cormorants, several species of Gulls, many species of ducks and many more. A Peregrine Falcon was in residence as well, but he was resting at the base of the sea wall and not actually flying. 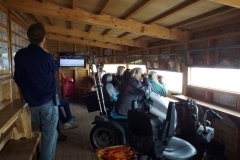 We had a super time in the Hides watching all the birds and a Volunteer, Malcolm, gave us a very useful commentary of what they all were. There was also a good variation of woodland and more well known garden birds around us too and much to our delight the little red squirrels were scampering around as well. We were accompanied by Johnny, one of the Rangers, who gave us a lot of information and made the day very interesting and worthwhile. Time goes so quickly on Brownsea and in no time our 4 hours were up and we had to make our way back for the ferry for 3 o’clock. If you can, to go over and see this magical Island, we do hope to do a DR ramble next year but it will be limited numbers - probably about 10 only - so do keep an eye on mailings from our Chairman re regional rambles if you want to come along. Starting from the Wyche car park we climbed steadily and fairly steeply to the summit of Worcestershire Beacon for our tea break. The clear and sunny sky gave us stunning views all around, stretching for miles. Descending north to the col between Worcestershire Beacon and the Sugarloaf led us on to Lady Howard de Walden’s Drive which goes all around North Hill. 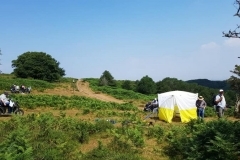 This fantastic track has only just been made possible for scooters to use thanks to work done by the Malvern Hills Trust which owns the land and works hard to improve access for all visitors. Lunch was taken at the Sugarloaf Café before climbing back up to Worcestershire Beacon and so on down to our cars or, for some of us, tea and cake at Café H2O. 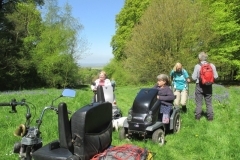 A really special ramble made possible thanks to the Malvern Hills Trust. We were delighted that Beck Baker, Community & Conservation Officer from the Trust came with us on the ramble and so could see the enjoyment that the ramble gave to our seven scooter riders and nine walkers – which included our friend Marika who is severely sight impaired and who was ably led around the hills by Beck. Our thanks again to her and the Trust. Not the brightest day but at least no sign of rain - so off we set from the car park up the long, steep path which leads to Chanctonbury Ring, an iron age hill fort on the West Sussex Downs. Luckily, there is a very nice plateau halfway up so we could stop for coffee break and to view the landscape below, and it also gave the scooter motors time to cool down a little. In places this track is 1:5 but we all managed it without difficulty, then it was lovely wide grassy tracks to a 4 track junction where we turned round and went back to the Ring for our lunch break, where we watched a kestrel hunting below us. The Downs are becoming green again after the recent rain, when we reccied it was brown and parched everywhere. One of our group, Roger, lives locally and suggested another route back to make this a circular ramble instead of linear, so we took his advice and it was really lovely and along wide chalky tracks with super views either side. In fact, all day we had wonderful views but unfortunately, the visibility wasn't very clear. There are clear signs of autumn with all the verge-side flowers turning to seed along the way. This area is criss-crossed with tracks and we intend to explore it more fully in the future with the help of our trusty guide, Roger!! We all had a really good day and had a super group of DR members - 10 scooterists in all, and 2 walkers. As usual, we met many walkers and cyclists who were astonished at what we can achieve, so we hope they will remember DR in the future when they may need us! Val and Bob. A great day out doing a reccie at Woburn. Can't wait to put this one on the programme. As ever this year we had a beautiful day for this slightly different to normal ramble. It's different because it's based in the quaint town of Arundel and not a countryside ramble as we usually do, so after parking near the Castle 10 scooterists and 5 walkers proceeded up the footpath beside the "moat" surrounding the Castle (or it's also known as the millstream), to Swanbourne Lake which started life as a millpond and dates back to the 11th century, it is fed by groundwater springs known as the Blue Springs" due to the colour of the water as it comes from the ground, which is mainly chalk. Then on up the valley through Arundel Park for a short while, by special permission of the Castle Estate, where we had coffee in the welcome shade of a large tree. From the lake we went on up to the Wetland Centre which is run by the WWT, Wildfowl & Wetlands Trust, who also run Slimbridge wetlands and bird sanctuary in Gloucestershire. We had a leisurely meander round the various paths looking at the unusual species such as black necked swans, native of South America. Many of the wildfowl just wander around the sanctuary and are very tame. We spent a lot of time resting in the shade but the sun was really hot and before we left two of our number had departed and thrown their hat in, so to speak! In the photos there is a picture of an "insect hotel" and on close inspection you will see a swarm of bees in the right hand corner which was quite a sight to see in the Meadow Maze. It is a lovely little wildfowl sanctuary with a super boardwalk ride through the rushes and lakes, also a boat ride which Sarah & Pete went on through the various lagoons and creeks. Special thanks to Simon Mockford, the SDNPA Ranger who initially asked us to reccy Swanbourne Lake with him and he accompanied us all the way from the Museum, round the lake and up to the Wetlands where, sadly, he had to go back "to the office". Simon was involved in vastly improving the path around Swanbourne Lake thus making is accessible for us. It was just a very narrow track that we wouldn't have been able to navigate and now it is lovely and wide and a very popular walk for local residents. During the walk Simon gave us a lot of info re the lake and surrounding area and listened to all our gripes and concerns with great resilience! The National Park are very helpful to us and willing and ready to help wherever possible, and that is greatly appreciated. An enjoyable, if very hot, day - thanks to all who came...without you it wouldn't work! Phew!! Val & Bob. This ramble started off at Staple Plain car park near the village of Holford and we proceeded up a very steep hill which the person writing this had been dreading - however, it was fine. The going on the whole ramble is very rough, steep, bumpy, tilting a little - but absolutely stunning. The views are almost unbelievable. Everywhere you look is breathtaking and seeped in ancient vibes, you can almost feel the presence of people from hundreds of years ago who used these many tracks on their way to market or just walking from village to village. We stopped for coffee break near a trig point, and we lost Bob!!! He had taken the wrong path back before the rest of the party left, but he turned up in the end and is fast getting a reputation for perhaps having to go on a lead, what with fords and wrong paths! Never mind Springwatch it'll have to be Bobwatch! L&P did the afternoon route in the morning and met us at the halfway point for lunch with the trailer as it was deemed the sensible thing to do because towing the trailer up the exceptionally steep & bumpy terrain we did in the morning would have exhausted the batteries very quickly and the afternoon part of the route was not quite as difficult as the morning. The descent back down to Holford in the morning was great, if bumpy fun, we all had to keep our wits about us and negotiate a very rocky, bumpy path for almost a mile or so. Sore wrists and other things were the order of the day. After lunch we made our way back towards the Great Road and stopped at Bicknoller Post where about 7 tracks meet and the scenery is too amazing for words with hills and valleys all converging and forming wonderful views all around, the mist was starting to come down over the hill which added to the atmosphere. The Great Road is an ancient droveway and is littered with loose rocks which require a bit of careful negotiation, but we followed this back to the car park after a very satisfying 8 mile ramble. One interesting coincidence is that the farmer where we were staying has lived on Exmoor for about 7 years but before that he did all the steel pressings for Tramper scooters and trailers for Beamer, we were astonished at the unlikelyhood of this happening out of all the farms on Exmoor. Small world. Finally, many thanks to ALL who put their heads together to make this tour so wonderful for us who attended. We often think that but for DR we wouldn't see nearly as much of the lovely and tranquil parts of the country that we are privileged to visit on our trusty scooters, photos don't do justice to the views but give a watered down vision for you to appreciate. 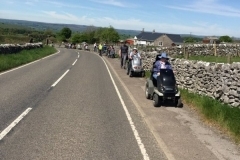 Special and huge thanks to all involved in towing the loan scooters, getting them out, putting them away and disposing of the chemical loo at the end of the day, all the volunteers, walkers and walk leaders. You are invaluable. After a day of rest on Wednesday we left to meet at Haddon Hill car park, but on our way to the ramble we got lost in one of the myriad of lanes but while finding our way out we saw a sign saying "beware of pheasants" which made us laugh, but round the next corner there was a flock of young pheasants just sauntering across the lane and it took ages for them to get out of our way, it was rather frantic for them running all over the place. On arrival, the car park was spacious with lovely views and good loo facilities, and our route took us down to Wimbleball reservoir and dam which helps supply Exeter. It was quite unlike Clatworthy reservoir which we visited on Monday in that dogs are allowed but on leads at all times, and was much more developed in the sense that it is a centre for water sports such as kayaking, sailing, windsurfing, rowing, canoeing with many young people having really good fun on the water but with all the safety precautions in place, and there is also a Sailability group who use the lake, plus there is a Tramper for exploring and a wheelchair accessible boat available on site. There was a large area for tents so quite an adventure for the students that take part in these activities. 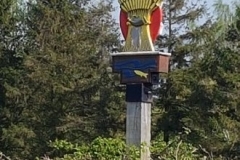 It is also a centre for fishing and birdwatching with many of the rarer species of both waterfowl and other birds present on the lake and in the reserve. The tracks were good and picturesque overlooking the lake at all times and also views over the surrounding hills and valleys. We had lunch at the Duck Cafe, lovely ice creams there! A really lovely day, not too difficult and a very good place to take a family for a fulfilling day out. 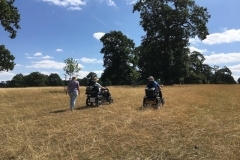 We had a special guest today - Julie Andrews from Able magazine who rode with us on one of the loan scooters, she attended with their official photographer to report on our day out, they were good company and a lot of fun. When we were having coffee break a member of the scientific team at South West Water arrived to take a reading of the water quality with his water gauge. He had to assess the amount of algae in the water and if it was too high the information goes to the treatment works so that the water is purified on its way through. All interesting stuff and shows that although we don't always realise it there's plenty of work going on to ensure our safety by the authorities concerned. Another super day...but tomorrow a 3+, oh dear! Day two - lovely weather again. Selworthy Beacon, elevation 1013 feet, lies north-west of Minehead and is situated within the NT owned Holnicote Estate, from the site of the Beacon there are views of the high moors of Exmoor and Dunkery Beacon, and also views across the Bristol Channel with Wales clearly visible on a good day. In the 16th century it was the site of a beacon to warn of impending invasions. It really is difficult to describe the views other than to say they are utterly breathtaking. We left the car park and trundled happily along with coastal views ahead and all the valleys to the side. This was a ramble across quite open moorland most of the way but as we went along the tracks you could smell all the different foliage and flowers and with the warmth of the day it felt really special and unique, some heather was flowering and was interspersed with low growing yellow gorse which, in turn, was greatly appreciated by many butterflies, they seemed to be out in force in the warm sunshine. We had a wonderful view of the village of Porlock nestling below us in the valley with the sea sparkling blue in Porlock Bay with Hurlstone Point and Gore Point forming the framework of the bay. We stopped for lunch and a rest and then followed the easy access path through the woodland where we saw the Wind & Weather hut erected in 1878 for use by the Acland family on their Sunday walks. This was a very enjoyable and very scenic ramble, with moorland, sea views, valleys, patchwork landscape of fields all around. It had everything, (and no steep 1:4 hills!). Thank you L & P for reccying and leading this ramble for DR and giving us such a super day. The first day of the Exmoor Tour and again, we were so lucky to have perfect weather. If you have never been to Exmoor - you have really missed something!! It is like a world removed from normal life, the lanes are tiny and very hilly and with wild bends, quite heartstopping at times, especially if you happen to meet a lorry, but this time of year beautiful with pink Rosebay Willow Herb and all had long silvery grassheads on the banks with tall hedges so that sometimes you felt in a maze, we were just getting used to it when it was time to come home. Clatworthy Reservoir is really beautiful, it holds over 5 million cubic metres of water and supplies some 200,000 homes. 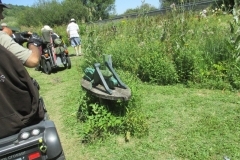 It is also used for fishing and apparently, there is a special wheelchair friendly boat for disabled anglers. We were accompanied by Ellie from Wessex Water who is involved with the well-being of the reservoir and working with her team to maintain the special species of insects and ecology of the area. 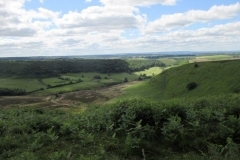 On one section Wessex Water have "terraced" the ferns (bracken) rather like a vineyard, so that a particular butterfly can have the specialised conditions it likes to breed. They have also uncovered interesting rock formations formed many thousands of years ago which have been scraped clear and we were able to see these. It was very interesting to have regular stops and talks from Ellie and made the visit even more worthwhile. The reservoir is tucked away in hills and valleys and is spectacular with good paths and views all around. This was a Cat 3 ramble, most of it was not a 3 but at the beginning was the most challenging hill I have ever undertaken, which made it a 3 (Cat 10 in my book!). Not only was it very steep, l:4 I believe, but it had hairpin bends and to add to the challenge it was also uneven with some interesting ruts, so quite an achievement to get up it - everyone managed extremely well, but I was relieved to get to the top - thank you Judy & Bernard for your support! A really super ramble and a terrific start to a very promising week. One of our members, Gordon Guest, has been working with Wessex Water to make sure this ramble was possible - so our thanks to Gordon for his efforts. Ravenscar circuit - 22.06.18 No, he wasn't winding us up! We parked at the quaint Station Tea Rooms at Ravenscar, the village that never was - In the late Victorian period plans were made for Ravenscar to become a holiday resort and roads were laid, a handful of houses built and sewers installed but it never really caught on probably because of the steep path to the beach - remnants of the resort that never was still remain. We proceeded up the road with lovely views all around and wild flowers galore, lots of pink spotted orchids, this bit was easy - then we came to Howdale Moor with tracks that threw everything at us, ruts, sideslopes, very uneven ground and we all had to do a balancing act at times on extremely narrow bits with furrows at the side - but due to our great skill we all managed! Cotton grass in abundance again and lovely views, skylarks as well. Then into some woodland, again with a tricky path but it was good fun, until we arrived at our lunch stop. Here a local gent came to see us with a hat someone had dropped and said he hoped we weren't taking the path down to the old railway track - we were - he said we were mad and wouldn't make it - slightly worrying, but reassured by Ian that we would - in the end although it was a very difficult, quite long and very overgrown path we did make it, not without some heart stopping "tilts" on our scooters, hooray for the volunteers! 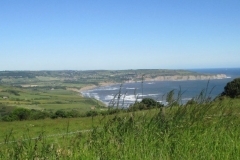 The old railway track offered some breathtaking views of Robin Hood's Bay and other coastal scenery, an absolutely super ramble - definitely Cat 3+ as stated - but very enjoyable. We arrived back at the Station Tea Rooms and made the most of the amazing array of cakes and cuppas before we reluctantly said goodbye to everyone before we went on our way and back to normality again. These four rambles of Ian's were superb and he was a very friendly, skilful and relaxed leader and we appreciate the hard work he put in to make our week so enjoyable. Many thanks to all of the invaluable volunteers, Veronica, Sarah for towing the loo most of the time and Dave for his stoical effort in towing on the last day, all very much appreciated. The weather for the whole week couldn't have been better either, we were very lucky and enjoyed it all tremendously. Val & Bob. Hole of Horcum - 21.06.2018 We set off fully equipped with hats, gloves, coats, from a very windy and cold Saltergate Car Park high on the moors overlooking the Hole of Horcum which is a huge natural amphitheatre 400 feet deep and more than half a mile across created by water welling up from the hillside which gradually undermined the slopes above eating the rocks away grain by grain, this process still continues. Our route was across Levisham Moor to the village of Levisham, and this moor is the largest ancient monument in the Nth York Moors with Bronze Age barrows and late Iron Age boundary dykes. A very picturesque route with good views on either side of us and quite spectacular "cotton grass" growing in the heather which looked like snow. Some difficult negotiating especially around a car parked on the pathway! It was mainly a good track though and we ended up at the pretty, quite isolated village, of Levisham with an excellent pub called The Horseshoe where we all had some welcome sustenance, like a big bowl of chips and such luxuries! Our trip back was rewarded by lovely sunshine and much to our delight an ice cream van in the car park, what more could you want? Another super ramble but tomorrow sounds a bit more difficult...........or is Ian winding us all up? PS We were able to borrow a Tramper so that Bob was able to continue rambling for the rest of the week after poor Dora's mishap in the ford, so we are very grateful to Chris and Ian for being so kind as to let us borrow these two machines and so continue with one of the best holidays we have had with DR. Val & Bob. Grosmont to Goathland - 19.01.18 The North Yorkshire Moors Railway has its northern terminus at Grosmont as it is a railway village with plenty of historical interest relating to the railway and the discovery of ironstone in 1836. 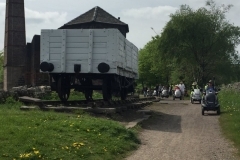 We followed the original tramway which ran between Grosmont and Goathland, there were many quite steep inclines and sharp turns onto narrow bridges and wasn't without its challenges. En route we could hear the steam train passing but didn't actually see it as it went through woodland. 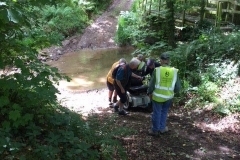 The sad case of the swamped scooter had a happy ending today as one of the members attending the ramble had a demo power chair which he very kindly lent us. 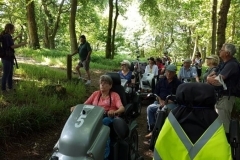 This wasn't without difficulty as it is operated by a joystick which is very sensitive so for the first part of the ramble Bob wove a very interesting route and probably did twice as many miles as the rest of us! 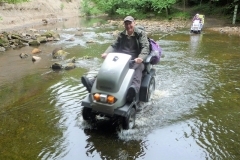 By the end of the ramble he was much more competent and even crossed two big fords without one drop of water getting into the motor! We had lunch at Goathland which was known as Aidensfield in the TV series "Heartbeat" and also as "Hogsmeade" station in the early Harry Potter films. A lovely ramble of tracks, open countryside, woodland, lovely wild flowers which as you passed them gave a lovely scent in the warm sun, for which we were very grateful. Val & Bob. Mulgrave Woods - 18.06.18 Sandsend car park is right on the coast with a lovely outlook and it was great to see many old friends turn up for this first ramble of the week, especially as the sun was shining - but was extremely windy. Mulgrave has been the family estate for the Marquis & Marchioness of Normanby since 1743 and extends to 15,000 acres. We were met by the Forestry Manager who led us into the woods and gave a very interesting talk about the way they manage and control all the various problems they encounter, such as ash tree die back, a fungal infection that destroys the ash trees and has to be rigorously controlled. We were also able to watch a very hi-tech tree felling machine in action lifting branches and stripping off the leaves and twigs and cutting them to length. The team are dedicated to conservation and protecting the flora and fauna, so much so that even the annual shoot is to be discontinued. We then proceeded through the wonderful woodland tracks to our lunch stop and where the "shoot" marquee made a welcome sitting area for our weary volunteers and walkers. Some of the braver ones went for a "rough ride", and all was fine until one of the group, who shall remain nameless (look at photos), crossed a ford and the scooter was swamped resulting in it having to be towed the rest of the way with two anchormen behind as the steep tracks meant it would run away and collide with the towing Tramper - what fun we have! The volunteers were amazing as it was hard work with the heat, and a scooter without its motor is so heavy and difficult to control. Made it back to base safely but a bit sad to have a sick scooter, oh dear! Was this the end of our holiday? The old castle ruins en route replace a motte-and-bailey fortification which acted as a HQ for its owners, in the 17th century it became a hunting lodge, and was re-fortified during the Civil War but was slighted by orders of Parliament in 1647. A new castle is in use by the Marquis and Marchioness on the Estate. A very lovely ramble through beautiful woodland, - thanks, Ian. Val & Bob. Graffham Regional Ramble - 12th June 2018 A lovely sunny day saw 12 of us scooterists and 5 walkers, including Matt the Ranger for that area, set off up the South Downs Way towards the Graffham Nature Reserve(s), these are 6 seperate little reserves off the SDW which are wildflower meadows with rare wildlife, wonderful views and archaeological features. We heard the quite rare tree pipit en route and going through one of the meadows with the fragrance of the wild herbs all around us a fallow deer ran across in front of us, really lovely to see. Yellow rattle, Valerian, Common Spotted Orchid, dark pink and white Pyramidal Orchids, dog roses, pink and white clover, and many other wild flowers were out in abundance with the oregano and other herbs about to come into flower. One crisis, one of us had a very flat tyre, but with some “gung” and a good shot of air from our electric pump (the wonders of technology - it connects with my Tramper with a cigarette lighter fitting) and we were on our way again. Two “heroes” to the rescue - Ian and Bob. This ramble was all about the reserves and wildflowers that are in the meadows with a few lovely views thrown in for good measure, but on the way back we stopped at Manor Farm for a cream tea and chat about disabled facilities with the farmer as he is hoping to provide a disabled loo and camping facilities among other things in the future and this made a very satisfactory end to a lovely day. As ever, many thanks to all who came - we do appreciate the effort involved in loading and travelling - and it was really nice to see Rosie & John out again after quite a long absence, and especially to Matt the SDNPA Ranger who accompanied us and gave us such interesting information about the flora and fauna on the way. Val and Bob. 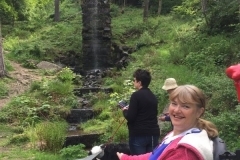 On our final day, we started off up the winding hill towards the Hunting Tower passing the beautiful smell of the bluebells, and a waterfall which feeds the famous fountain. At the highest point we stopped for a break to look over the surrounding green countryside. Here we were joined the gardeners cutting the grass in front of the tower, but they kindly stopped and had a break with us. Continuing we passed the lakes, Swiss Cottage and the early flowering Rhododendrons and returned to the car park for lunch. Our afternoon ramble went across the fields on the opposite side of the grounds passing closely to the lambs and sheep in the fields, and in the distance, we had glimpses of the many deer who live in the park. Our coffee break and photo opportunity, was by the Golden Gate entrance before continuing alongside the river back to the road. Owing to the preparations for the RHS show in June, the field we wanted to cross was cordoned off by an electric fence. Arthur displayed his expertise by lifting out the posts and with Bernard’s help made an archway for the group to pass under the fence to get back into the car park to end, another successful and memorable day. 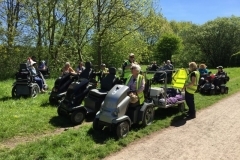 From Cromford Wharf car park, we set off along the lovely Cromford canal to High Peak junction where we took our first break and Rick Gilling, Ranger, gave us a very interesting talk on the history of the High Peak Trail. We continued up the 1 in 8 hill for about a mile and a half to a flatter section overlooking Cromford and beautiful surrounding area, where we had a photo call and coffee. We continued up another steep hill to Middleton Top for lunch in the sunshine on the field below the visitor centre. On our return we called at the Stone Centre for a tea and cakes and a puncture repair to a member’s scooter. Bernard and Paul worked extremely hard to fix the problem but on this occasion were unsuccessful. I continued with the group back to Cromford car park whilst Bernard stayed with the breakdown and then hitched a lift back to the car park. 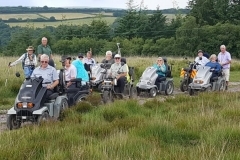 Our large groups in various locations in on this tour have caused lots of interest from both the locals and visitors who have been given leaflets and information about the organisation and have told us that they think it is a great idea for disabled people to enjoy the countryside in this way. At Hartington Old Station we parked in the Horse box area owing to the high number of members. We set off along the Tissington Trail towards the village of Biggin. Unfortunately, a member was unable to continue and so she and her husband returned to the car park with a passing cyclist who they knew. The group continued to Biggin leaving the trail along the pavement to the A515. 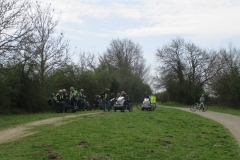 This was an extremely busy road and we needed 5 marshals to stop the traffic before the group crossed safely into Cardlemere Lane, to some shade from the lovely sunshine, for a coffee break. This lane took us to the Pennine Bridleway and High Peak Trail giving us wonderful panoramic views over the Derbyshire countryside. We had another busy road to cross further on and the same marshals were in action again. Our thanks to everyone for getting us safely across. Our lunch was at Findon by the brickworks where we were able to read about its history. Our final stop at Parsley Hay visitor’s centre, had wonderful views whilst enjoying afternoon tea, cakes and ice cream. Members would have been happy to have stayed much longer, soaking up the sunshine. A large group of 30+ ramblers met at the Bakewell Agricultural Centre car park where it was extremely busy with farmers arriving for the Monday livestock market. After the briefing in a quieter area we set off along the Monsal Trail up Castle Hill to the old Bakewell Station. It was a glorious day with wall to wall sunshine which stayed with us all the week. The morning coffee break was just before Hassop station and then we continued up the very gradual hill towards Monsal Head. Unfortunately, owing to a member feeling unwell and needing to return to the car park we had to split up the group and our thanks go to Jeff and Paul for escorting her safely back. The remainder of the group continued through the Headstone Tunnel to Monsal Head for lunch. Bernard climbed up to the car park on the hill and returned with ice creams for those who wanted them. On our return we met up again with Jeff and Paul and had a break at the Hassop station for teas and cakes before returning to an almost empty car park, quite a stark difference from the morning. 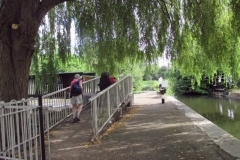 Beautiful Regional Ramble St Ives and Houghton Mill in Cambridgeshire 26th April. Stanmer Park, nr Brighton - 20th April 2018 This is our second visit to Stanmer Park estate which covers 5000 acres with a pretty village, manor house, farm, church and cafe and is on the outskirts of Brighton next to the campus of the University of Sussex It is a very beautiful park and has very many varied paths through the woods and downland that formed the basis of our ramble today. From the car park we proceeded up a steep hill to the trail that leads all round the estate, we did a reccy last week and could only get halfway round as the mud and puddles were so deep and thick, but luckily we found another route which led us up a quite bumpy and furrowed track which needed a bit of care to negotiate but was through lovely hedgerows and fields back into the woods where we had our lunch. The woodland scene was really springlike with leaves just starting to show on the trees and with bluebells, anemones, forget me nots, violets, cowslips and other early spring flowers along the way. So we had a steep grassy hill, nice flat trail, down a tarmac estate road (but very quiet - never see any cars but of course, today we saw 2), then onto a quite challenging and rough track - had to keep them awake somehow! - then into quiet woods for lunch. Coming out of the woods you look down onto the parkland of the estate before going downhill to the exit gate. We then went up to the village to get a well earned cuppa and ice-creams at the cafe before trekking back to the car park. Our contact, Will, at Stanmer Park had very kindly reserved one whole car parking area for us for the day - this is usually crammed with students cars and it never ceases to amaze me how helpful all the different authorities that we request help from are. Very grateful. 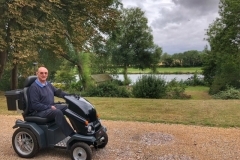 So, this was the last ramble of the first Tour of 2018 and very enjoyable too, many thanks to Bernard and Judy - they work extremely hard to enable the loan scooters to be used by DR members and like Bob and I made sure we were there very early so that everything ran very smoothly. Alarm set for 5.45 every morning! Now for a rest!!! Val. Jack & Jill to Ditchling Beacon via The Chattri. - 19th April 2018 This is a jewel of a ramble, one of those that sticks in your memory for ever. We had the hottest day in the UK for 70 years, a week before at the reccy it was mist, thick mud and deep puddles but today it had dried up completely and instead it was rather hard en route, but you can’t have everything. We started off going through a farmyard onto a steep downhill track with lots of loose large flints littered over the ground which needed careful negotiating, and then on to little bridle paths meandering through the South Downs and over and round freshly ploughed fields, it’s like another world - just beautiful scenery everywhere you look, as you can see from the photos. It was quite a challenging ramble and the sun had baked the mud making it the soil very hard. We managed to find some shade to have our coffee break before proceeding to The Chattri, a memorial erected in memory of the Indian soldiers who were hospitalised in the Royal Pavilion in Brighton after the 1914-18 war. This lovely memorial was erected on the cremation site of these soldiers and the word “chattri” means “umbrella” in Hindi, Punjabi and Urdu symbolising the protection offered in their memory, it is in a very peaceful and tranquil setting. This was our lunch stop, earlier than planned, but there was shade which was very precious so we made the most of it. On our way back up to the main track along the South Downs Way to get to Ditchling Beacon, we passed a tractor ploughing with flocks of seagulls, difficult to capture on a photo, but it gives an idea of the effect. We also saw hares, kestrels, lots of sheep and their new lambs around a dew pond, and highlight of the day for me and Sue G was a Yellowhammer just hopping about on the ground near some gorse bushes, really lovely. It is difficult to describe the beauty of this part of the South Downs but we want to go back and do it again this summer, it is a new route for us and the Ranger, Andy, who came with us is going to put work into motion to improve another track along the route so we can do another loop and so make another new ramble. A super day - so glad the mud dried up though! Thanks must go to Lucy for suggesting Jack & Jill to Ditchling Beacon which we were then able to enlarge to incorporate this beautiful route to The Chattri, and many thanks to all who came, and as ever the volunteers and walkers who help along the way. Val. Southwater CP to Chesworth Farm - 17th April 2018 Well, this was “the ramble that wasn’t but became something else instead”. Lovely day again and we set off from Southwater CP to follow this nice ramble through the byways and paths around the market town of Horsham. Our route led us through a particularly lovely old wood with bluebells, forget me nots, milkmaids, carpets of white anemones, celandines and wild garlic all coming out and at the end of this wood was the path we needed but unfortunately, due to the heavy rain this had become so eroded that it was not possible to continue as it had become a deep chasm, so David - our Leader, devised a different approach and we all turned round and set off towards Chesworth Farm. Unhappily, this was not to be as one of our group had battery problems due to a charging mishap, so in the end we decided to go back to the Country Park and have lunch and then explore around the lake there which has swans and other waterfowl on it. Luckily, we had a spare loan scooter which came in useful for our member with the depleted battery. Due to David working with the Wardens at the CP a lot has been done to improve access through the park and we had a good wander round after a restful lunch at the cafe. Still a good day with lovely weather and thanks once more to David for leading, and our volunteers who worked so hard through the day with road crossings etc. and towing the trailer, we’d be lost without them. Val. Shoreham to Bramber - 16th April 2018 Our first ramble of 2018 and we were so lucky that the weather for the whole week is forecast as being really spring-like and fine. Phew! We were pleased to welcome three new members and it was great to see Nomi out again after health problems over the last few years. Parking for this ramble is particularly difficult so we were lucky to get a whole layby allotted to us opposite the landing field of Shoreham Airport. We then progressed over the old Tollbridge, where there is a temporary memorial to those who perished in the terrible Hawker Hunter aircrash of 2015 a permanent and beautiful memorial is going to be erected in the near future. 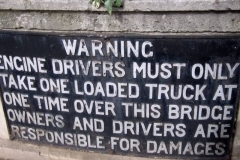 Rather alarmingly, workman had put barriers up as the centre of the bridge had subsided and left just enough room for us to pass through either side - they said the high tide had washed away the bank underneath leaving a huge and deep hole. The scenery on this ramble is very lovely and on our left as we went along the Downs Link path is the haunting and Gothic looking Lancing College which always looks very eerie especially if it’s misty. Also, there are farmsteads with the typical Sussex buildings and an old Norman church in the distance. All the Spring flowers are starting to come out, celandines, milkmaids, some bluebells starting to show and lots of lambs. Arriving at the pretty village of Bramber we had our lunch stop, and our first ice cream of the year! The ruin of Bramber Castle looks over the village but the hill up to the ruins is very steep and “camber-y” and not really easily accessible for our scooters, or only for the very brave, so we didn’t take the risk. After lunch - homeward bound on a slightly different route and along the banks of the River Adur, rather bumpy for those on the top path, moderately bumpy on the bottom path but with the risk of deep mud, luckily the wind and sun had dried it up very well. This ramble was almost 9 miles but is a really super route and one of my favourites, as well as not presenting too many difficulties and the scenery is just great. 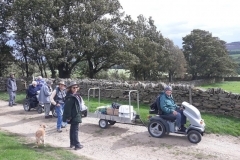 Thanks to all for coming, many thanks to David for leading, and here’s to a very successful season of Disabled Ramblers treks through the beautiful countryside of the UK. Val.